As printing technology has evolved, so has the essential profession of proof reading. But though the technical details have changed, the purpose has not: To ensure that a printed work will be a precise, word-for-word match with the manuscript's final edited draft. Typographical errors used to result from slips of an operator's fingers on the keys of a linotype machine, or from a bad scan by an early generation optical character reader. Now they are likely to stem from high-tech issues: Mistakes in consolidating various digital versions of a manuscript, or glitches in electronically flowing text onto a page, or errors overlooked in the editing stages. Another important aspect of proof reading is checking details that exist only in a book's final, printed (or published e-book) form. Are page numbers correct? Does text wrap correctly from page to page? Do chapter headings match the table of contents? Are illustrations, footnotes and other material in the correct places? Is the spacing between elements consistent? Are words hyphenated correctly when broken at line endings? Is the typography consistent, with all sizes and fonts correct? A professional proof reader is accustomed to looking for such problems. 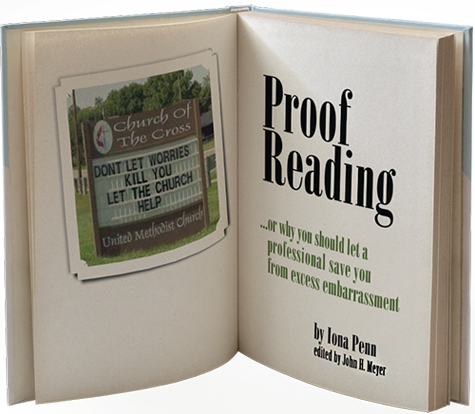 An author's smart, educated, helpful friend who volunteers as an unpaid proof reader may not even know these things are an issue -- and lets them go uncorrected. Who needs proof reading? Every author does. For every work. The harm that uncorrected errors can cause to your reputation may make it difficult or impossible to get your next book published. Can you proof your own work? Yes and no. Sure, you can review your own press proofs. But it's a cold, hard fact that typos and other errors are invisible to the author's too-familiar eye. And there's a difference in temperament between a writer's creative mind and a good proof reader's meticulous, fussy mental habits. Is proofing enough? It may be, if you are an experienced writer, accustomed to the detailed work of ensuring your copy is both clean and clear. But the vast majority of authors need both careful copy editing as a first step, and diligent proof reading at the conclusion of the publishing process. Had the pastor who posted this inspirational message on the church marquee only asked his secretary to take a critical look behind him, he would have been spared the embarrassment of seeing his gaffe go viral. Don't let this happen to you! Before 10,000 copies of your first novel go to press, let an experienced professional proof your pages. It's still not too late!